The successful Russian air strikes against ISIL in Syria have exposed the hypocrisy of the United States, an American writer and political analyst said. Mark Glenn, a writer and co-founder of the Crescent and Cross Solidarity Movement, spoke in a phone interview with Press TV on Saturday. “What we have to remember here is that Russia was able to achieve in two weeks’ time what America did not achieve in two years’ time, meaning that the Russians were in and engaged these terrorists in the way the Americans were pretending to engage with these terrorists,” Glenn said. He explained that the US officials hoped that the presence of these terrorists on the ground would allow the US or NATO to invade Syria and remove Bashar al-Assad. On September 30, Russia began airstrikes against ISIL terrorists in Syria at the request of the government of President Bashar al-Assad. Since then, Moscow has carried out dozens of airstrikes against terrorists in Syria, killing hundreds of militants, Press TV reported. On Friday, a senior Russian general said there has been growing restlessness among ISIL militants with their command in Syria as they are getting ‘demoralized’ and are abandoning their locations and fleeing for their lives. TEL AVIV, Israel — Earlier this month, Shia militiamen in Iraq dropped off an American-supplied Abrams tank at a US-supported repair facility where workers were surprised to find an attached Russian machine gun plus Iranian ammo, Defense News has learned. “They brought it in through Iraqi checkpoints, back-rolled it off the trailer and then drove away,” recounted the source. After US-led coalition airstrikes were forced to destroy about 10 M1A1 Abrams main battle tanks (MBTs) seized from the Iraqi Army by the Islamic State group, often called ISIL or ISIS, Washington is now grappling with the phenomenon of their voluntary transfer to Shiite forces battling in concert with Baghdad against the fanatical Sunni Caliphate. Al-Hashimi said this isn’t the first time Iraqi forces — looking for more firepower to battle ISIL — have integrated Russian weapons systems onto American platforms. Iraqi forces need to integrate different systems as they receive weapons from American, Russian, Iranian and European sources, al-Hashimi said. Iraq has a long history and experience in weapons and hybridization, al-Hashimi said, noting that Iraqi military experts may have acquired assistance from some of the estimated 5,000 to 6,000 international consultants present in the country from many countries including Russia, the US, Iran and France. With Thursday being a national holiday, Iraq’s Ministry of Defense could not be reached for comment. He was referring to the area adjacent to Baghdad’s US-dominated Green Zone, where, since the Iraqi Army’s stinging string of defeats at the hands of ISIL, sovereign Iraqi forces are cooperating — and often interoperating — with Iranian-backed Shiite militias against their common enemy. The area designated as Amber Zone is now home to two regiments of Iraq’s 9th Armored Divison, each with 35 Abrams MBTs, a contingent from the Iranian Quds Force, Hezbollah, the Asa’ib al-Haq (AAH) and at least one other Shia militia loosely organized under the so-called Popular Mobilization Forces (PMF), which is ostensibly under the command and control of the government in Baghdad. US and Israeli intelligence sources note that Iran has flooded the Iraqi theater with billions of dollars worth of weaponry and ammunition since the Baghdad-sanctioned formation of the PMF in June 2014. 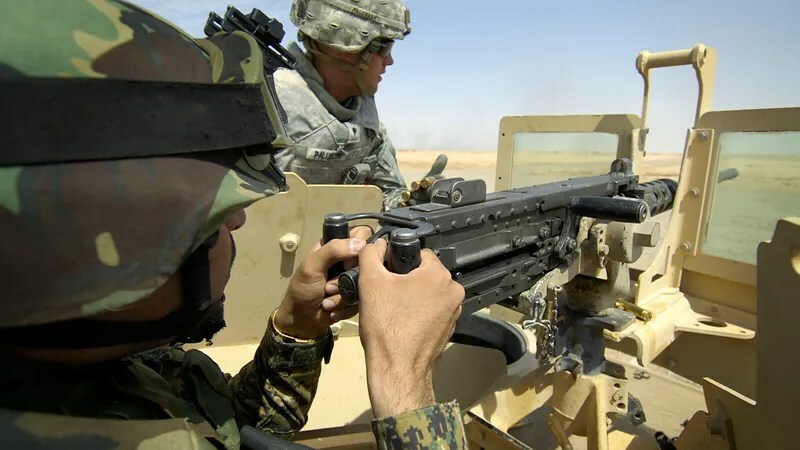 Washington also continues to send US State Department-approved and congressionally notified weaponry to Iraq on condition that US materiel remains under the strict command and control of Iraqi Security Forces (ISF). But a video posted in January, in which a convoy of US vehicles, including an Abrams MBT, was shown flying the Hezbollah flag as they passed through the Iraqi desert offered circumstantial evidence that Iranian-controlled forces under the PMF umbrella have gained access to US-origin hardware. At the time, Iraqi officials sought to assure their US counterparts that the convoy in the video was still under ISF control, and that the Hezbollah banner was simply displayed in solidarity for the Shiite militia sacrificing on their behalf. Similarly, when told about the latest development, a source in Washington speculated that the hybrid tank could have been delivered to the facility by militiamen acting as drivers or subcontractors to the ISF. “It doesn’t necessarily mean that the tank was in direct control of the militias. We simply don’t know,” he said. Yet another source suggested that the overabundance of Iranian ammunition and the preference many Iraqi soldiers still have for Russian-origin machine guns may have triggered an ad hoc rigging of the US tank for purposes of convenience. US Central Command headquarters in Tampa, Florida, declined comment on the reported hybrid Abrams MBT or on the constitution of forces in the Amber Zone, referring all queries to the Combined Joint Task Force at Camp Arifjan in Kuwait. There, US Sgt. Vanessa Kilmer referred Defense News to CJTF’s Media Ops Center, where, after 24 hours, detailed questions submitted to Sgt. First Class Eric Rodriguez were returned with “no additional information on this subject” and a recommendation to contact the Iraqi Ministry of Defense. A US State Department official said he would need more information to determine whether Iraq could or should be held accountable for any end-use violations. “We have made clear that the coalition will only support Iraqi efforts against ISIL that are under clear ISF command and control. We have received assurances from the government of Iraq and the Iraqi Security Forces that they will use US equipment in accordance with US law and our bilateral agreements,” the official said. Section 40A of the US Arms Export Control Act mandates two forms of end use monitoring (EUM): the Blue Lantern program managed by the State Department and the Golden Sentry program delegated to the Pentagon’s Defense Security and Cooperation Agency. The former focuses on pre-checks before an export license is granted and post-checks to determine that the designated materiel has reached intended end users. The latter, managed by primarily by the Pentagon’s in-country security assistance officers aims to ensure that recipients are using the equipment properly as stipulated in various government-to-government agreements. “Our mandate to conduct assessments in-country and to visit military installations is agreed upon by the Letter of Offer and Acceptance (LOA), which have notes and provisos that commit the recipients to proper end-use assurances,” a Pentagon official told Defense News in an interview two years ago. Retired Israel Air Force Maj. Gen. Amos Yadlin, a former head of Israeli military intelligence, said he would not be surprised if Hezbollah forces in Iraq or even Syria had access to frontline American MBTs. “It’s not surprising, because the Iraqi Army and the Shia militias and the Iranian Revolutionary Guards Quds Force and some American Special Forces are now fighting against the same enemy,” Yadlin said.